Documentary Film Screening and talk-back. 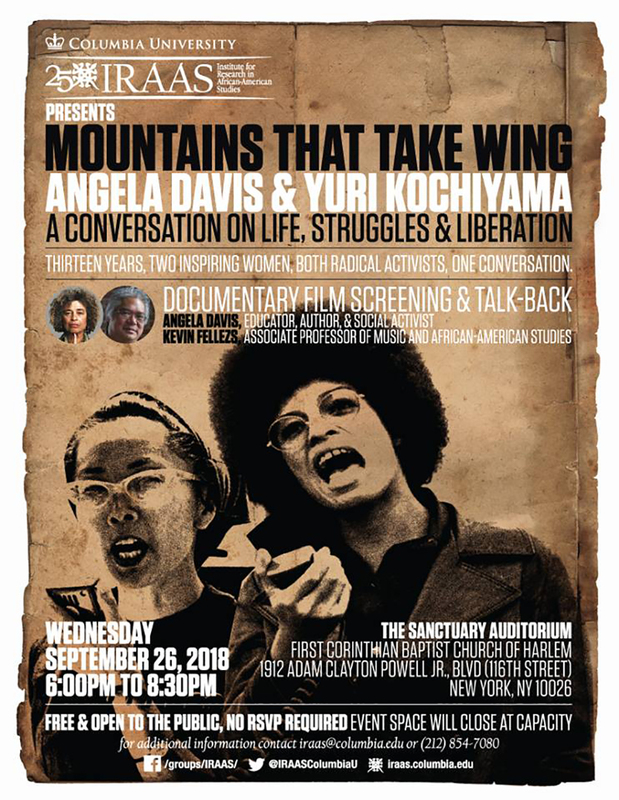 Mountains That Take Wing – Angela Davis and Yuri Kochiyama: A Conversation on Life, Struggles and Liberation is a documentary featuring conversations that span thirteen years between two women who have dedicated their lives to progressive political change. A film screening followed by a conversation between Angela Davis and Kevin Fellezs, assistant professor of Music and a core faculty member of The Institute for Research in African-American Studies. The event is free and open to the public. 1912 Adam Clayton Powell Jr., Blvd (116th Street) in Harlem. Thank you to Dr. Gregory Baggett for the heads-up on this. Next Next post: Three on 3 Presents ~ Celebrating 9 Years!